So, first-of-all, we will create a project in firebase, then we will create an Angular 7 app using visual studio code, then we will integrate firebase firebase project with Angular 7 project, and then we will write some code for two factor authentication. Let’s start to add two factor authentication ( 2fa ) in Angular 7 using firebase in step by step. So, in this step, we will create a firebase project. 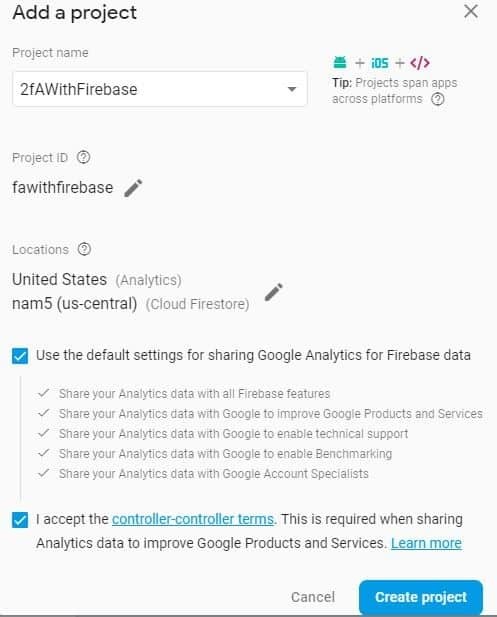 To do this, just click here to go to firebase, then click on “GO TO CONSOLE” link from top menu, and then click on “Add project” and then you will see a new popup as you see below. Now, enter the name in “Project name” and then check the “I accept ….” checkbox and then finally click on “Create project” button as you see above. Then click on “Continue” button and then you will see your project firebase project is ready. Now, go to settings icon from sidebar and then click on “Project settings” as you see below. And now copy the “Web API Key”. We will use this key in project integration. Now, in this step, we will create a new angular 7 project using visual studio code. So, open visual studio code and then go to terminal and then write this below command to create a new angular 7 project. After some time, this above command will create an angular 7 application. So, now go to project directory and then go to app folder and then create a new component using this below command. Now, angular 7 project is ready. So, go to angular 7 project folder directory and then go to “package.json” file and then copy these two lines of code ( line # 11, 12) and then paste in the dependencies as you see below. Now, go to terminal and then run this below command. This above command will install all the firebase dependencies. Now, go to app.module.ts file and then copy the below code (line # 8,9,10,13, 24,25) and then paste into the app.module.ts file as you see in below file. Now, go to environments folder under the app folder and then open the “environment.st” file and then write the code as you see below. Note: – replace the web api key with yours. Finally, angular 7 project and firebase project integration is completed. Now, in this step, we will write some code for two factor authentication in our component. So, go to component which we have created previously and then write click on the component folder and then click a “New File” with the name “WindowService”. Now, write the code as you see in below file. Now, open passwordless-auth.component.html file and then write the code as you see in below file. Now, open passwordless-auth.component.ts file and then write the code as you see in below file.